Next week is spring break. The way I look right now I’m the poster child for spring break. I need sleep. I need a healthy child. I need a healthy husband. I need not to work until past 11 pm every night. I need to do some dishes. After I sent this lunch, I worried I didn’t include enough protein so I overcompensated the rest of the week. My husband bought a whole pineapple at the grocery store and he cut it while our son watched. The pineapple in our lunches was fresh. 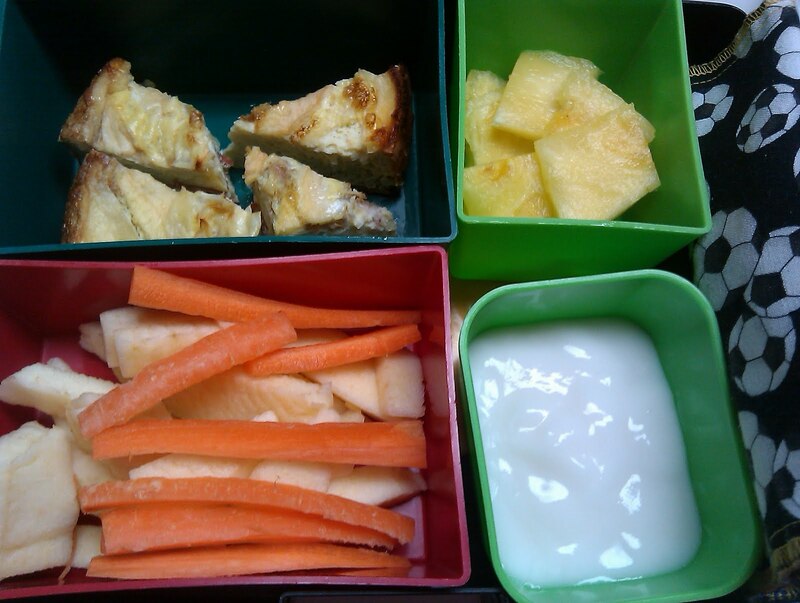 Daycare menu: Meat & cheese lasagna, pineapple bits, green beans with fruit and crackers and American cheese as snacks. We went out for dinner to a gluten-free restaurant not to far from our house. I sent the half of a chicken pesto sandwich we had leftover. Daycare menu: Ground beef, mashed potatoes, orange wedges, diced carrots with fruit and ice cream as snacks. The kid was not that crazy about the pasta. 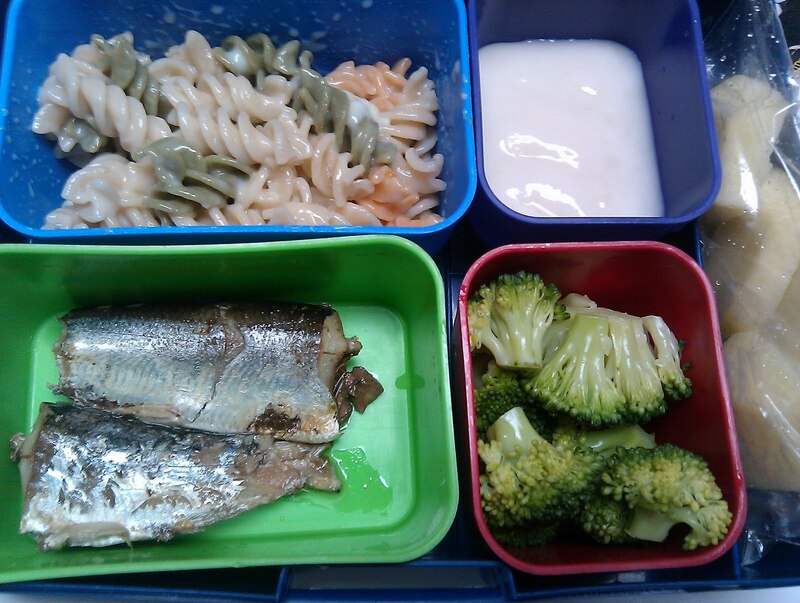 Day care menu: Tuna with pasta, diced pears, peas with yogurt and fruit as snacks. That morning I was out of ideas. 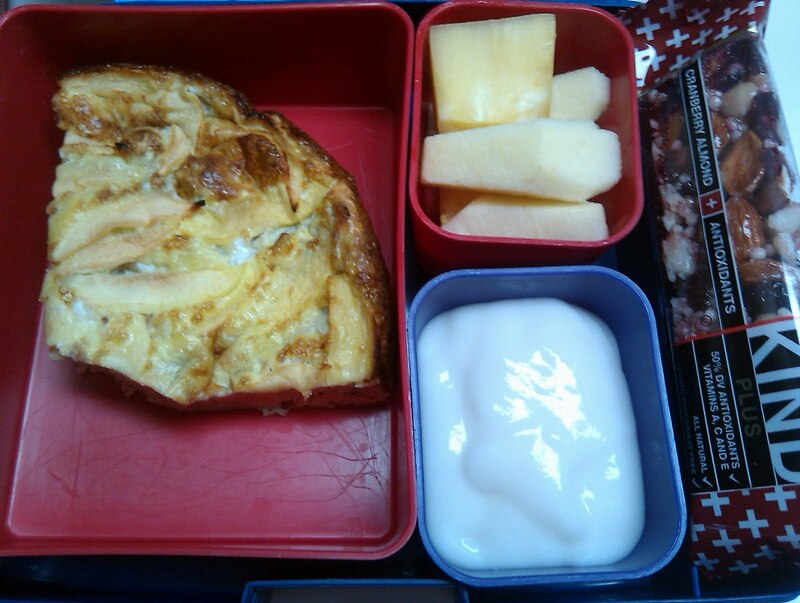 Day care menu: Cheese ravioli, strawberry yogurt, diced peaches, green beans with fruit and yogurt as snacks. 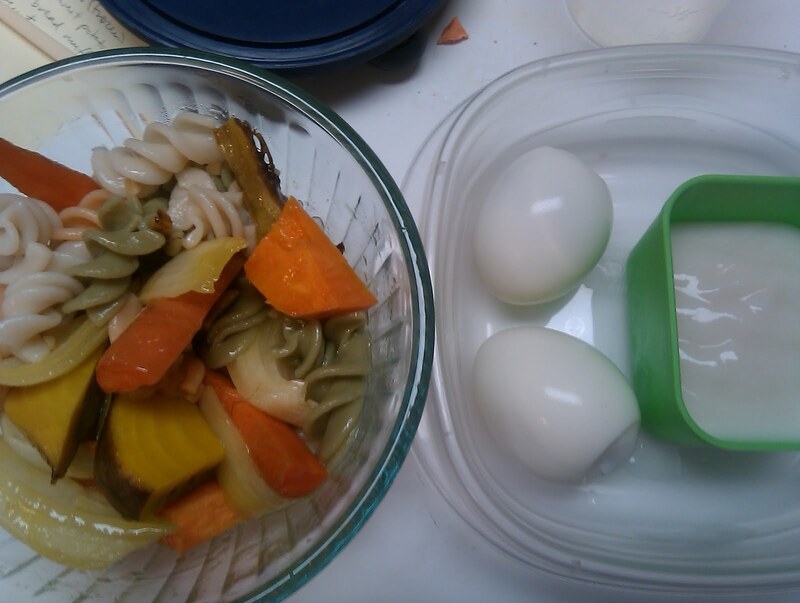 I find that it’s very easy to hard boil eggs in the morning. 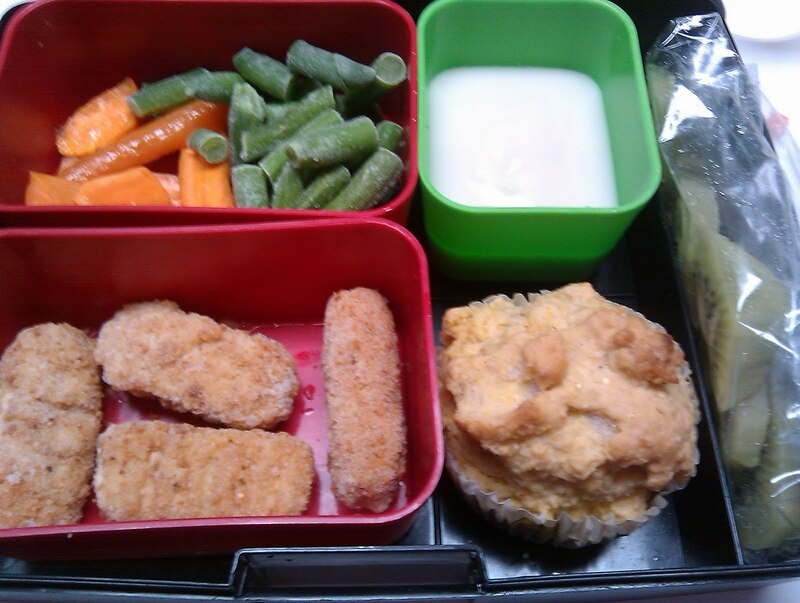 Day care menu: Chicken nuggets, mac and cheese, applesauce, diced carrots with fruit and blueberry muffins for snacks. 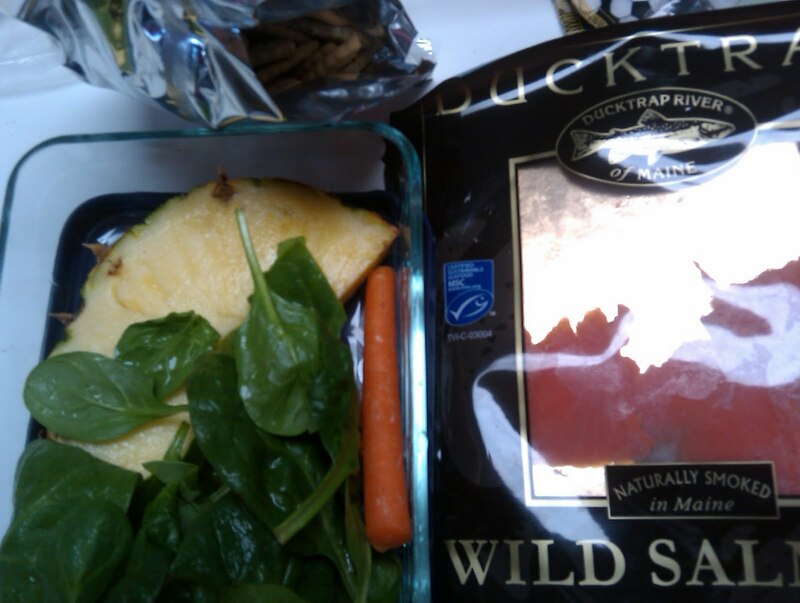 I’m always trying to find a new twist on a “sandwich.” Here I used gluten free crackers for petite salmon and spinach sandwiches. Lots of salmon and sardines this week to help combat my vitamin D deficiency…actually I should probably see a doctor over break to make sure my levels have been going up. I have always enjoyed sardines. To eat the kiwi, I packed a knife and spoon so I could cut it in half and then scoop out the yummy insides. 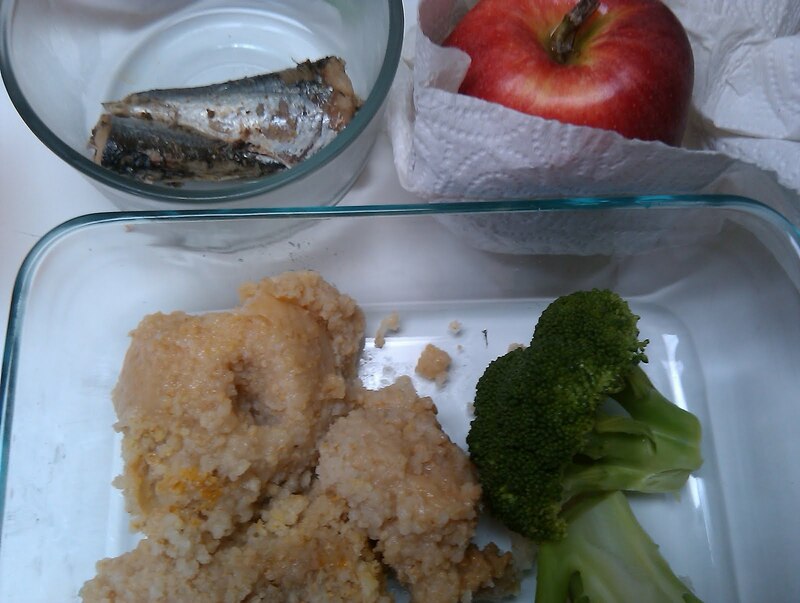 I’m loving these “rustic” lunches. Because I’m going to be on vacation this coming week, I’m not going to photograph my lunches unless they are truly exceptional. I need a break. I’ll share this week’s lunches next weekend and we’ll be all caught up! I never thought of cutting a kiwi and spoon it out! I should try that. Aw, I look forward to seeing the lunches. I really look forward to seeing your son's lunches. 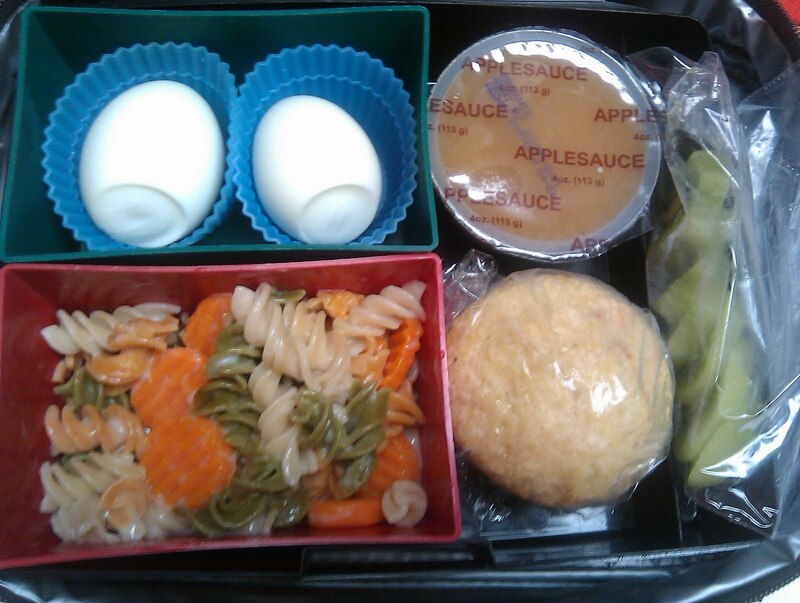 I hope one day I can pack my own kid yummy lunches. 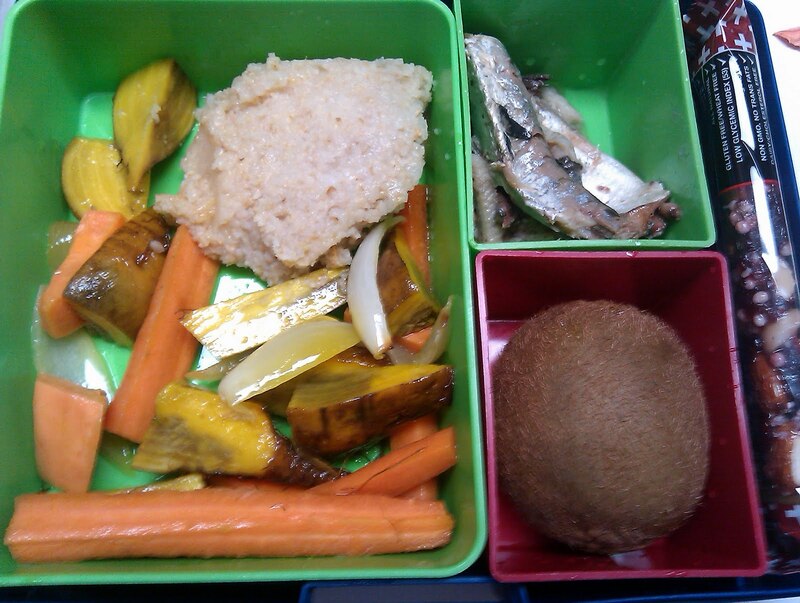 I also look forward to your lunch pictures every week. They always look delicious and make me so hungry! You've inspired me to go buy some kiwi because I haven't had it in ages. They make spifes for the very purpose of eating kiwi. If you can find one, let me know! I've been hunting for a while. My daughter loves eating kiwi this way. Looking good! Don't worry too much about the protein–a toddler only needs about 16 grams per day, and since your son eats meat and eggs he should be fine. One whole egg has 6 grams of protein. I'd love to encourage you to nominate your school for the 2011 KIWI Crusaders Award, KIWI Magazine's search for excellent school lunch programs. Three winning schools will receive $2,500, plus a feature in KIWI Magazine! Fantastic! Now I don't feel alone. 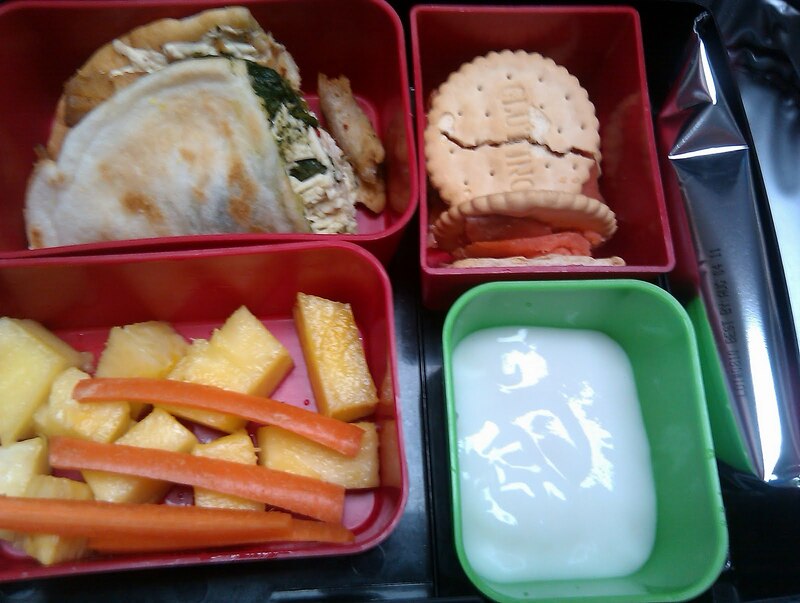 I'm fanatic about making my kids lunches healthy. Good to know there are mothers like you. Another great 'portable' food is sweet potatoes. Microwave 3-4 minutes depending on size. Take it with you and it peels so easily, tastes good cold or hot. You know, you can eat the skin of a kiwi…You don't need a knife and spoon in that case. It's quite nice and the skin is hardly noticeable because kiwis are so darn juicy. I was hesitant at first, because I don't like fuzzy textures (peaches for example) but I tried it and it was great. Lots of fiber too. If you eat the skin though, you should try and get organic kiwis. I have never eaten sardines. They look 'whole' in your photos — do you eat them with the skin on and everything? Maybe we need a sardine tutorial! Where do you get the sardines that don't come in oil, mustard or hot sauce? That's all we have in our grocery.